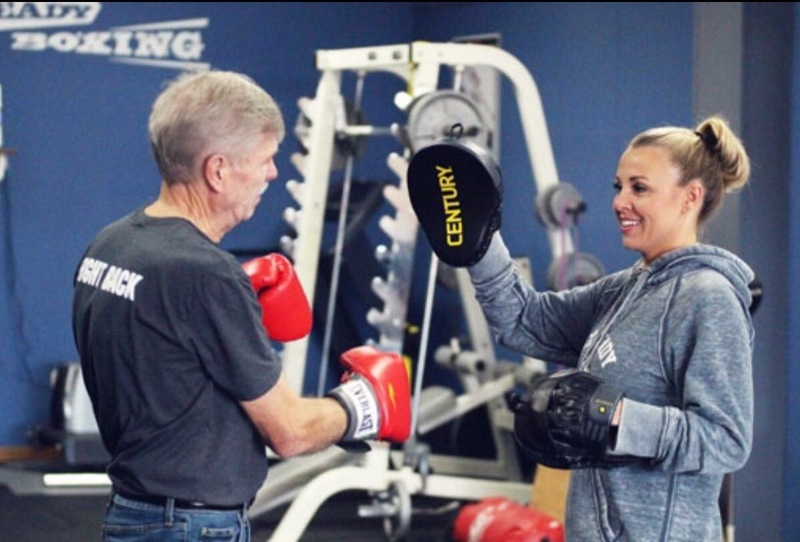 Rock Steady Boxing (RSB) is a first-of-its-kind, Indianapolis-based nonprofit gym founded in 2006 to provide an effective form of physical exercise to people who are living with Parkinson’s. Though it may seem surprising, this non-contact boxing-inspired fitness routine is dramatically improving the ability of people with Parkinson’s to live independent lives. RSB was founded by former Marion County (Indiana) prosecutor Scott C. Newman, who was diagnosed with Parkinson’s disease at age 40. Rock Steady Boxing enables people with Parkinson’s disease to fight their disease by providing non-contact boxing-style fitness programs that improve their quality-of-life and sense of efficacy and self-worth. Recent studies also suggest that intense exercise programs may be “neuroprotective,” actually working to delay the progression of symptoms. RSB provides encouragement through a “tough love” approach, inspiring maximum effort, speed, strength, balance and flexibility. Boxing works by moving your body in all planes of motion while continuously changing the routine as you progress through the workout. RSB classes have proven that anyone, at any level of Parkinson’s, can actually lessen their symptoms and lead a healthier/happier life. HELP: Help, Exercise, Learning, + Pain Relief. Support: We offer support groups and provide educational sessions that can help ease our members every day lives. Camaraderie: Friends for fighters and caregivers. We want our members to feel in control of their life again by utilizing our program specifically designed with them in mind. They are not alone in this journey and we will all fight together! Training classes, taught by Certified Rock Steady Coaches, include an exercise program that attacks Parkinson’s at its vulnerable neurological points. While focusing on overall fitness, strength training, reaction time and balance, workouts include: ring work, focus mitts, heavy bags, speed bags, double-ended bags, jump rope, core work, calisthenics and circuit weight training. No boxing experience is necessary and people of all ages are invited to participate. Boxers, both male and female, range in age from mid-30s to early 90s. Initial assessment with boxing coach: $50, After the initial assessment, boxing gloves will be ordered. Past participants will not need an assessment. Rock Steady Boxing is always in need of caring and reliable volunteers. If you would like to help the Parkinson’s patients in our community, join our class every Tuesday + Thursday from 9:30 am – 11 am. Online Registration for Rock Steady Boxing: click here.